Nets-Raptors has provided us with an exciting season series, in which the teams split four games, 2-2, each winning once on the other’s floor. The Nets beat Toronto twice by two and four, lost by one (in one of the most stinging losses of the season, thanks to Deron Williams’ imbounding), and lost by sixteen, in a game that was close through three quarters, before the Nets tired, coming off a rousing double overtime win against Miami the night before. If those games are any indication, this series figures to be extremely close. Let me start here. I think that nearly all takes on Deron Williams out there have been wrong. There is a large contingent of Nets fans, and of the media, that has said that Williams has been terrible, or mediocre, this season. The evidence cited for that has been his traditional statistics, given he only averaged 14 and 6 on the season. I have long stated about Deron — and really, about all players, that to me, it’s never purely about the statistics, especially the traditional ones. A basketball team’s goal is to, as a team, execute a gameplan that leads to getting defensive stops, and putting the ball in the basket on the other end. It does not matter which specific defender is guarding the shooter, which particular player hits the shots, or which particular player gets traditional boxscore credit with the assist. What matters is what the players are doing that leads to those actions occurring. In Williams’ case, when he has been healthy this season, he has made a large impact for Brooklyn. The Nets had a net rating of -.6 this season (offensive rating – defensive rating). However, they have had a +5.2 net rating this season in Deron’s minutes. The 5.8 net rating difference: that represents the difference between first and twelfth in the NBA, or twelfth and 24th. For perspective, the next highest net ratings are Livingston at +2.3 and Pierce at +2.2. The reasons for the net rating improvement are obvious. When Williams is at his best, he is able to attack the defense off the dribble. That leads to one of two things for the Nets. Sometimes, Deron’s attacking leads to switching, which causes mismatches like a small guarding Joe in the post, or a big guarding Pierce outside. Other times, it leads to doubleteams, and either Deron hits the open man or makes the pass leading to the pass to the open man: a pass he does not get credit for in the box score. When Deron is off? He does not make that impact, and Livingston is simply not the same distributor as Williams. The offense is simply worse when Williams is off the floor as a result — the Nets 13th ranked offense surges to 5th in Deron’s minutes. That being said, much of the crowd citing Deron’s net rating statistics have taken them too far. While they show that Deron is not average, they show that he has been good or perhaps very good, but not great. The problem? Kyle Lowry has been great, and the Nets may need Deron to be great too. A great player does not simply elevate the play of those around him, something Deron truly has done. A great player is able to, when things bog down or other struggle, take the game into his hands. That is something Deron’s barely done in 2013-214. The question? Will he be healthy enough to do that? Will he be confident enough? Will he sense that he will need to do that when the time arises? Lowry has done that this season for Toronto, so if Deron is unable, he will at least need to be able to stop Lowry from doing it. Basically: the Nets can win the series if Lowry slightly outplays Deron, but if he severely outplays him the Nets are in trouble. If Deron outplays Lowry? Then the Nets are in excellent shape. If there is a reason why Toronto is underrated (which I’ll discuss below), it’s the high quality play of these two bigs. Valanciunas has had a fantasic season, and Johnson has been an excellent bruising force up front, with the ability to hit jumpers on one end, and switch onto multiple positions on the other. Pair bigs like this with a developing Terrence Ross, an elite backcourt in Lowry-DeRozan–that’s a tough team to beat. This matchup is HUGE for Brooklyn, because it will test their ability to go small. The Nets hope that by going small, they can force Valanciunas to guard Garnett out to 18 feet, and force Amir to guard Paul out to the 3 point line. If the Nets can use Paul’s quickness to expose Toronto’s bigs, Toronto will not be able to cross match, and may be forced to go small, which will help the Nets on the other end. The interplay: the Nets smallball attack is tough for bigs forced to chase smalls, and can lead to both exploitation and fatigue? However, if the Nets allow Amir and Jonas to own the offensive glass on the other end, the small ball attack could be hurtful, and that may force the Nets to go big – and thereby be less effective offensively. Basically, smallball makes the Nets much more potent on O, and if they can survive with it defensively, that will go a long way towards winning the series. However, if the Raptors expose it defensively, the Nets may be forced to go away from what’s made them so successful. Overall, that makes the Pierce v Amir Johnson matchup (given each’s advantage on both ends), and to an extent KG vs Jonas Valanciunas, and the interplay between smallball and bully ball, big on both ends of the floor. Much is being made of the Nets advantages off the bench in this series, and the advantage is worth mentioning. First, it will be helpful directly, if the Nets can outscore the Raptors when their respective benches are in. Second, it could be helpful indirectly: if the Nets bench plays well, the bench could see extended minutes, beyond that of what the Raptor bench sees. That can be extremely helpful to the Nets when the fourth quarter comes. If there are 6 minutes left in the game, and Lowry, DeRozan, and Jonas have 38 minutes under their belts, while KG has 25, and Deron and Joe have 30, that could be extremely helpful from a fatigue standpoint. At the NBA level, playoff teams are simply so good, that mistakes may simply come from fatigue. You miss a rotation, blow a coverage, or hit front rim, out of exhaustion. If the Nets bench can win its battle, it can help in that regard, by keeping the starters fresh for the end of games. If it does not, Kidd may have to overextend them. However, one thing does need to be stated. Large as Nets alleged bench advantage is, much of it is predicated on streaky shooting. Teletovic has improved defensively and has become more well rounded offensively, but is still a minus on court when missing his 3. Marcus Thornton is more well rounded than we all presumed, but is also a minus when missing his 3. Andray Blatche goes into offensive funks where he is not scoring, and that makes him a big minus defensively. Mason Plumlee will come off the bench with Andrei Kirilenko, and they should have an impact, but if all three of the Nets streak shooters are off? Suddenly, the Nets bench is one that will struggle to score, and which does not have the advantages that are being discussed now. Overall, the offfensive output of Blatche, Mirza, and Thornton could be the difference between advancing, and going home. Coaching matters in the playoffs as a series wears on. It may not matter much in game 1, where teams simply use the game plans that have worked all year, but it will as a series wears on. During the regular season, teams tinker depending on their opponent, but they cannot do anything substantial from an adjustment perspective given they play a new team every night, there’s not much time between games (with much of said time lost to traveling) and the concern is to simply get by with enough W’s to make it to the second season. In the playoffs? With 2-3 days between every games, all against the same team, there is suddenly an incredible amount of time to prepare for games, and make adjustments as a series wears on. As for Casey? Sure, he’s never coached at this time of the year, but we do know that he’s served as an assistant, and his signature coaching moment was in Dallas (ironically, coaching Kidd), where he constructed the zone defense the Mavs used to topple LeBron’s hated Miami Heat. Such a zone likely would not phase the shooting loaded Nets, but it’s worth mentioning. As for Kidd, we literally have nothing to go off? Overall, what will happen from an adjustment perspective is interesting. The Raptors have succeeded because of their large frontline (which has bolstered their top 10 Lowry-DeRozan piloted offense by spearheading a top 10 defense), while the Nets have thrived with smallball. If either tactic works more effectively early, will the other coach panic? Kidd discussed meditation and being calm and serene prior to the playoffs, but will he abandon smallball to quickly if Toronto hits Brooklyn in the mouth in game 1? Or will he stick with it too long, if through the first half of game 3 it’s still not working? Will Casey panic and deviate from his large frontline if the Nets come out with gusto? We don’t know the answers to these questions? Last year, we knew Thibodeau would overwhelm PJ Carlesimo, and watching it happen as we all knew it would hurt, and hurt bad. This time around? Kidd is not as stubborn as PJ, while Casey is not the tactician Thibodeau is. We shall see what we shall see. This is really the big key for Brooklyn. For all the talk of not meeting expectations, the $190 million roster, and all else surrounding Brooklyn, the largest problem has simply been injuries. KG missed a month late in the year, Kirilenko missed two months early, Pierce was not himself for a month of the year, Deron for 3 months, and the list goes on. The Nets will need everyone to beat this Raptors team. Deron as I cited above is the guy that turns Joe and Paul into deadly complements: without him they are forced to create, and do so inefficiently. If Livingston’s hurt, the Nets’ smallball defense is not nearly as good given he is such a pest on that end. Without KG, the Nets lack a center who can both shoot and guard. Without Plumlee, Nets lack a jolt of youth. Without Paul or Joe, the Nets attack becomes substantially less potent: those are Deron’s two key cogs offensively. Without Kirilenko, the Nets’ bench is defenseless. Without Teletovic, Thornton, or Blatche, the Nets’ bench advantage (as I say above) becomes muted. -Much of the worry out there about the Nets “lack of momentum” given their 1-4 close to the season (during which they did not really try hard and benched players) is overblown. The statistics out there show that momentum coming into the playoffs does not matter (see two articles on this topic: http://insider.espn.go.com/nba/story/_/id/7832652/nba-momentum-means-going-postseason-especially-miami-heat — and — http://www.basketball-reference.com/blog/?p=5544). The bottom line is there is NO evidence for this idea that teams play better in the playoffs when they come in on a winning or losing streak. With multiple days between the season and playoffs, then multiple days between playoff games, those games are forgotten and forgotten quickly. Lest we forget the Nets came in riding high last year, won their first game by 27, and promptly lost 3 games (2 in convincing fashion). As a fan, it is natural to see the Nets win and simply FEEL comfortable – that doesn’t mean that the win makes winning the next night more likely. -Minutes management: There has been much criticism of Kidd managing minutes, and keeping playing time down. It is natural to see a team go on a run when starters are sitting and want them back in the game, but ultimately, there is much data out there that teams with players whom lead the league in minutes DON’T succeed in the playoffs. It’s simple math: the human body is not a machine, and must be properly managed, especially when the body is an older one. By keeping minutes down, Kidd has a fresh team now. If guys look spry, please remember that. But by the same token, Kidd kept minutes down so that guys would be fresh now. He should not kill guys with minutes, but probably should be more liberal with playing time for his top guns now that the second season has started. -I am not sure where the idea arose that the Nets “tanked so that they could draw Toronto.” Coming into the stretch run: with TWO games left in the season, the Bulls were the three seed, the Raptors the four. With ONE game left, the teams were tied: so the Raptors were three, but with the teams so neck and neck, it was basically a 50/50 proposition that the Raptors would finish 3. Given the Raptors lost to close the season, the Bulls would be the 3 if they beat Charlotte — and they lost the game in overtime. Translation: the Nets were a single Bulls point from a Chicago-Brooklyn matchup. Here is really what happened. Once the Nets beat Miami, they knew that they succeeded in avoiding a Heat-Nets round 1, but also could not obtain homecourt advantage. Given they were playing really for nothing — they had no control of their round 1 opponent given the above 50/50 odds, they simply stopped playing. They played not to get hurt or sat and did not play at all. As an aside, the idea the Nets tanked to face Toronto shows that many underestimate how good this Toronto team is: I am not sure where the idea the Raptors are a slouch game from. Since dealing Rudy Gay, Toronto is 42-22. They have the league’s 9th best offense and 9th best defense: both better than Brooklyn. They have an elite backcourt with two players that give you twenty points a night, routinely, bolstered by a tough frontline, and nice role pieces like Terrence Ross and Greivis Vasquez. Maybe it’s because fans don’t anoint teams until they see it happen in the playoffs. Maybe it’s because fans expect certain teams to break out because they have superstar names, so when THEY break out, we are ready to give them their due (i.e. : The Wizards, whom are viewed as better than the Raptors, despite the Raptors winning the season series and winning more games). Bottom line: Toronto is the third best team in this eastern conference at this moment. They had a better year than Brooklyn, Washington, Atlanta, and Charlotte, and while Chicago defends a bit better, they don’t have the ability to score with Toronto’s potency. Forget your preconceived notions. This is an excellent team. -There seems to be an idea the Nets messed up a good playoff bracket situation. First, most did not want to draw Chicago, and yet this still transpired. Second, sure the Nets play Miami a round earlier now. But do you honestly expect the Heat would not be waiting in round 3, were the Nets to beat the Pacers to get there? And isn’t it better to play them a round earlier, with fresher legs, instead of after playing the Bulls and Pacers (whom, even if we won, would wear us with their physicality)? There is no such thing as a good playoff bracket. -There is also a perception the Nets blew a chance for home court advantage with their recent losses. That comes from a tendency to naturally weigh more recent results more heavily, and is not really true. Teams that start seasons 10-21 don’t make the playoffs, let alone grab home court. With that start the Nets had to go a whopping 39-12 to earn home court: a 63-19 pace. You know how many teams reached the 63 win plateau this season? ZERO. I’m all for being upset at a lack of home court, but don’t blame the failure to hit a 63 win pace to close the season: there was simply no margin for error and there’s a reason nobody won 63 games this season. Blame the 10-21 start: playing 38% of the season at a 26 win pace is what caused the lack of home court. 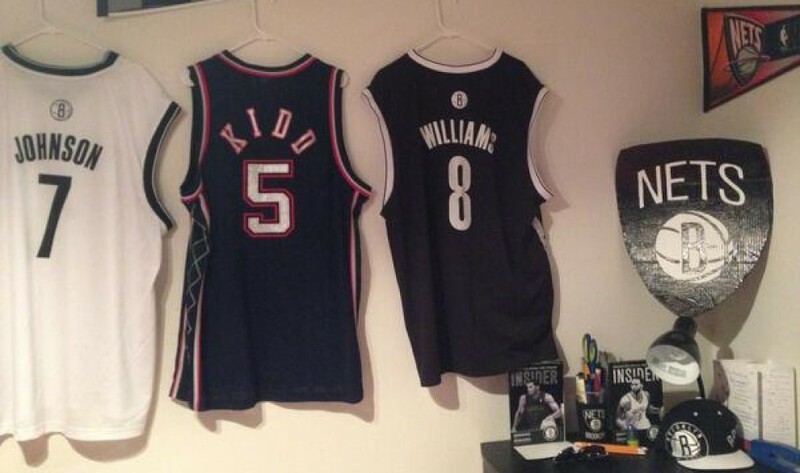 -It must be noted that Kidd’s done a decent job with the Nets, all told. He smartly deviated from big ball to suit the Nets personnel. He experimented with Pierce off the bench and at the 4, was not afraid to see if Teletovic could fit, had the gall to start Livingston in Brook’s place, and was patient, never panicked, and did not grate on the guys, which led to the team not quitting on him. Kidd may be outcoached these playoffs, but they say when you’re a great player that if you want the credit, you better take the blame. The reverse applies here: if you want to slam Kidd when things don’t go well, give him some credit for the season turnaround. -At this point, throw out the 82 games, and realize one thing: by and large, the Nets should be judged on their playoff performance. I said all year long that all you could ask for as a fan was a title contender. A title contender in this bracket would knock out Toronto, then give Miami a competitive series, at least make them and the media sense some outcome related doubt. Will that happen? We shall see. PREDICTION: Nets in six. This is going to be a tough series. Toronto, as I said above, truly is excellent. They play top 10 defense because they are well coached and have strong defensive personnel, and combine that with top 10 offense led by two home run hitters offensively. The Nets will struggle with their speed, and could struggle with their size. They key to me: I strongly believe the series goes six or seven games, regardless of outcome. However, it is extremely tough to win a road game 7, and I doubt the Nets if that situation arises. The Nets need to steal home court and get a 3-2 lead into Brooklyn for game 6 (if they don’t win the series prior, something I doubt). If they do, they need to cash in on that series winning opportunity. What a trip! Following six straight road games (with the All-Star break and a separate road game before them), the Brooklyn Nets are finally back at the Barclays Center. The road trip concluded on Saturday night in Milwaukee where the Nets took care of the Bucks 107-98, marking their fourth win of the six game trip. Aside from their disastrous performance in Portland (a 124-80 defeat), the Nets should be extremely proud of the way they performed over the 11-day trip. The circus road trip got off to a great start in Utah, the former home of Nets PG Deron Williams, with a 105-99 win over the Jazz. Joe Johnson led the way for Brooklyn with 27 points and Deron Williams looked great for the first time in a long while with 19 points and seven assists. The victory marked Deron Williams’ first win in Utah since being traded to the Nets in 2011. Three days later, the Nets found themselves in Oakland for a battle with the Golden State Warriors. Neither team looked particularly great as the Nets got absolutely torched by Jermaine O’Neal (yes, I said Jermaine O’Neal) and the Warriors shooters just couldn’t seem to get anything going. The game seemed to be there for the taking for the Nets until a Steph Curry bank three-point shot sealed the victory for the Warriors and marked the first loss of the Nets road trip. The next game wasn’t the most entertaining as the Nets handled the Lakers for the most part, however, this was in no way an insignificant game. The Nets made history by signing Jason Collins, making him the first openly gay athlete to play in any of the four major North American leagues (NBA, NFL, MLB, NHL). Collins entered the game to a loud ovation at the Staples Center in a truly touching moment. The following game for the Nets isn’t really worthy of a recap, as the team just didn’t even bother to show up for the game. Portland completely dominated the Nets from the opening tip, even without their all-star center LaMarcus Aldridge. The only bright spot in the game was the first appearance of the Nets’ new acquisition, Marcus Thornton. Thornton was originally slated to play against the Warriors but he unfortunately had a tough bout with food poisoning after some bad lobster mac-n-cheese. Yikes. The Nets looked to bounce back from their embarrassment in Portland with a win against a depleted Nuggets team in Denver, and bounce back they did. The Nets held the Nuggets to just eight points in the first quarter en route to a 112-89 final. While I would like to credit the Nets with a dominating defensive performance, the Nuggets really just could not seem to get anything going at any point and continually missed layups, dunks, and open shots. Despite Denver’s struggles, you can’t deny the incredible effort of the Nets to bounce back so strongly after their disastrous trip to Portland. The sixth and final game of the Nets circus road trip pitted the Nets against the dreadful Bucks in Milwaukee. As much as I would like to say that the Nets took care of business and dominated a bad team, that wasn’t the case – this game was close up until the final minutes. The Nets ultimately took care of business behind Marcus Thornton’s game-high 25 points. Thornton played incredibly well and shot the lights out from three-point-land as he produced exactly what the Nets hoped he would – points and energy off the bench. With the post-all-star resurgence of Deron Williams and some savvy trade deadline moves, the Nets look to be poised to make some noise in the eastern conference down the stretch of the season. It will be interesting to see if Williams can keep up his raised level of play for the rest of the season; it’s not a stretch to say that the Nets’ playoff hopes rest on his shoulders (and ankles). The Brooklyn Nets (27-29) look to pull with one game of the .500 mark as they take on the Milwaukee Bucks (11-46) tonight in Milwaukee. The Nets look to build off of their 112-89 win in Denver versus Nuggets on Thursday by finishing their yearly circus road trip with a 4-2 record with a win tonight against the Bucks. The Bucks are coming off of a 101-96 loss to the Indiana Pacers in Indiana on Thursday. A game in which they rallied back from a 17 point deficit early in the 2nd quarter vs the Eastern Conference’s top team to make it a close one. The Bucks are 2-3 since the All-Star break (2 losses to Indiana) and could very well catch a Brooklyn team who normally plays down to competition off guard tonight. The Nets have lost six of their last eight games in Milwaukee but have won the last two games they’ve played at the Harris Bradley Center. The Nets lead the season series between the Bucks 2-0 but haven’t swept the season series since taking all four meetings during thee 07-08 season. – With a Nets win tonight they can become only 3.5 games behind Toronto for the division lead. Loss = 4.5 GB. – Kevin Garnett is OUT for the Nets tonight with back spasms. Rookie Mason Plumlee will start in his place. – Milwaukee waived former small forward Caron Butler on Thursday. Game 5 of the preaseason is in the books. Here are some of my observations and takeaways from tonight’s game. Nets-Celtics, Preseason Game 4: What Did We Learn? The fourth game of the Nets preseason is now over, with the Nets topping the Celtics 82-80. Here are some takeaways from tonight’s game.